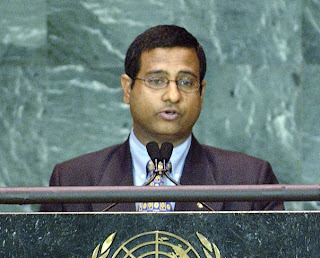 The Iranian delegate to the UN Human Rights Council was today condemned by the UNHRC President for disrespect after he accused UN Special Rapporteur on Iran Ahmed Shaheed of colluding with "notorious terrorists" in producing his human rights report. In his presentation, Shaheed drew attention to five Ahwazi Arab cultural activists currently facing execution, stating that they were tortured and were not given a fair trial. He also criticised Iran's treatment of human rights defenders, raising the issue of five Kurds who were arrested for contacting him on human rights abuse. Other issues addressed in his presentation were the harassment and arrest of independent journalists and defence lawyers, the widespread use of torture, the persecution of religious minorities and the treatment of members of the "Green Movement". Iran: "Shaheed working with US-backed terrorists"
Without addressing any of the points in Shaheed's presentation, Iran hit back with an attack on the Special Rapporteur. Its delegate Mohammad Javad Larijani, the secretary-general of the Iranian high council for human rights, alleged "selectivity" and the "manipulation of human rights machinery" by the United States in order to achieve a result in line with US interests. 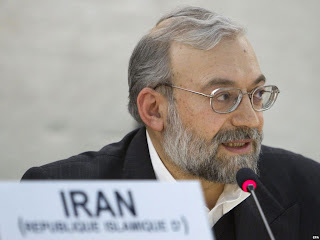 The attack in the UNHRC followed unfounded accusations by Larijani and other Iranian officials that Shaheed had been bribed by the US government. Larijani also maintained that lesbian and gay rights were a "cultural invasion" and "an assault on Islam" that had no relevance to the work of the UN Human Rights Council. Shaheed was accused of a "hypocritical approach to human rights" by the Iranian delegate who claimed he had "failed to meet minimum standards of impartiality, honesty and fairness" by colluding with a "notorious terrorist cult", an allusion to the Mujahideen-e Khalq (MEK). He ended his speech by claiming that the "US and European states train, arm and use terrorists against Iran and these terrorists were Shaheed's sole source of information. After the delegate was reproached by the chair for "derogatory and disrespectful" remarks, delegates from European states lined up to condemn Iran's treatment of women, ethnic and religious minorities and human rights defenders. The main target of criticism was the scale of executions, the use of torture and the lack of fair trials, particularly ongoing executions of juveniles. Iran did, however, receive support from North Korea and Venezuela as well as an equivocal response by Ecuador which accused the UNHRC of being manipulated by the "imperialist interests" of the United States, but nevertheless condemned Iran's use of the death penalty. North Korea and Venezuela offered no defence of Iran's human rights record, but criticised the country-specific mandates of UN Special Rapporteurs, which they claim unfairly target the developing world by powerful Western countries who seek imperial dominance by interfering in internal affairs. The UNHRC's dialogue on Iran was suspended and is due to recommence on 12 March at 9.00am CET.